Pregnancy yoga is the perfect way to connect with your mind, body, breath and baby. 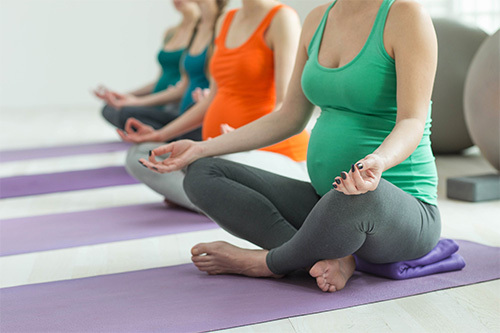 Each lesson will focus on specific topics relating to pregnancy and birth, exploring postures, breathing techniques, and relaxation techniques which can help you and baby throughout pregnancy. Specific yoga postures are used to help prepare the body for birth, focussing on areas such as the pelvic floor, abdominal area and pelvis, all of which play a significant and important role during pregnancy. Strengthening and alignment exercises will be incorporated for each of these areas, and their role and function during pregnancy will be discussed and explained in detail. In addition to physical postures, classes will introduce helpful breathing techniques which have proven invaluable during labour, whilst relaxation gives you the time to let your body rest and prepare for the months ahead. These classes follow a gentle flowing sequence, and are suitable for ladies who are 12 weeks and over. Any ability is welcome, as these are small, private classes which allow for a tailored experience and a chance to meet other expectant mums. Please see your GP or midwife if you have any concerns or specific queries with taking part in these classes at any stage. If you are interested in taking part in any of our Pre-Natal Yoga sessions, please submit an enquiry form or contact the clinic direct.